British artistic gymnast who earned a bronze medal at the 2016 Olympics on the horizontal bar. He also had a standout performance representing England at the 2014 European Junior Gymnastics Championships. Later that year, he won team and individual gold medals at the Commonwealth Games. He was born in Leeds and won the Young Sportsman award at the Leeds Sports Awards. 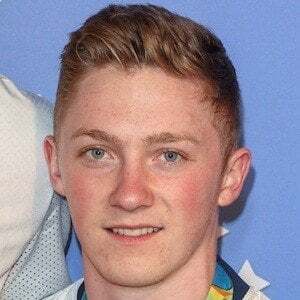 In 2014, he won five gold medals at the European Junior Gymnastics Championships, becoming the first gymnast in history to accomplish this feat. His parents are Sally and Neil Wilson. He also has a sister named Joanna. He's in a relationship with cheerleader Gabrielle Green. He came in second to Scotland's Daniel Purvis in the parallel bars at the 2014 Commonwealth Games.